"I love this recipe because it is quick and easy to throw together, with an end result that is tasty and comforting." 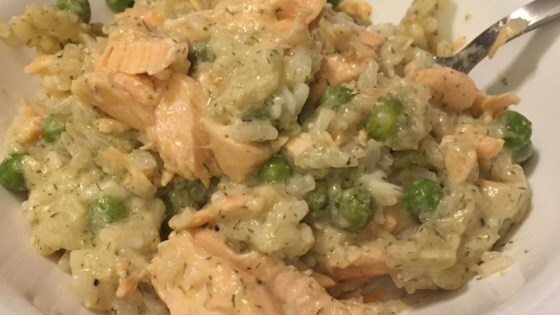 Stir water, salmon, white rice, chicken soup, broccoli soup, dill, and lemon pepper together in the crock of your slow cooker. Stir peas into the salmon mixture and continue cooking for 1 hour more. This can also be cooked on Low for 6 to 8 hours, again adding the peas for the last hour of cook time. This was a quick and easy meal, however I recommend not cooking for longer than time requested. It became a bit mushy because I cooked all day on low while at work. not for me--will not be making this one again.